Service Style When our clients plan their events, we are with them every step of the way; when they leave their event, guests are raving about the exceptional service they were provided by such an attractive friendly crew. We know our food is outstanding because of the clean plates and multiple helpings, but nothing brings more satisfaction than the appreciation our staff receive for their generous service. Our staff takes great pride in providing service with grace and precision. They know just how to give your guests as much attention as possible without being overbearing—to make them feel comfortable and pampered. Hospitality Training We have trained our managers, servers, bartenders, planners, and warehouse employees in both the formal process and the etiquette of hospitality service. Our training program demands that all staff have hands-on experience at events under the direction and mentoring of a senior supervisor. Staff is evaluated on client feedback as well as execution of standard operating procedures for service. As a result, our staff is confident, successful, and rewarded. They smoothly and creatively handle unanticipated situations or changes in plans that may arise. The majority of staff has been with us for a decade. As we grow, we continue to recruit only the best poised, educated and experienced staff. Teamwork Aaron’s Catering is a team-based company. Staff approaches events together. Every event begins with a planning meeting that includes the chef, event manager, warehouse/logistics coordinator, and décor specialist to pull together all aspects of your event. Every event benefits from the collective talent, experience and creativity contributed by the team. 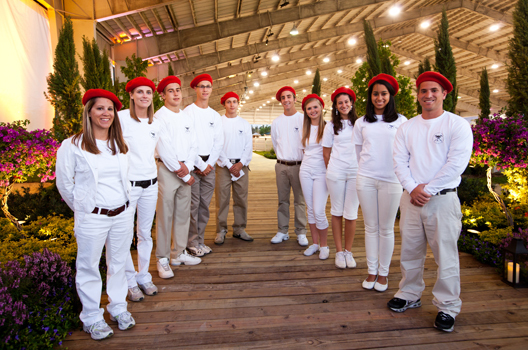 The team that plans the event delivers the event. Our staff is international, from Asia, Europe, and Latin America, bringing treasured recipes and traditions to enrich your event. They travel together—taking trips across the United States in order to stay up-to-date on the latest culinary trends. Recent culinary adventures included Thailand, Israel, Napa Valley, Austin, Oregon, and the Berkshires. Our crew comes from diverse educational and professional backgrounds. In addition, they are cross trained so each staff member can back-up other staff members and jump in to support any aspect of the event. They even volunteer together— participating in many philanthropic events throughout the community, growing closer as a team in the process. FULL SERVICE EVENT STAFFING ACPB provides trained, professional event managers, chefs and culinary assistants, event planners, event captains, décor specialists, bartenders, kitchen prep staff, utility staff, and service staff. Banquet Captain/Manager A Banquet Captain/Manager will be present for every event. A table-side served dinner will typically require one service person for every 15 to 20 guests, for an average timespan of 8 hours per server which includes set up, guest service, clean up and travel time. A traditional buffet will need one service person per 20 to 25 guests, from 4 to 8 hours, depending on the menu, event program and location. Hors d’oeuvres, stations or passed, may need one server per 30 – 40 guests based on type of menu. Executive Chef An Executive Chef will be present for every event. Additional culinary staff will be added for every 50 guests. Action-stations require a chef attendant serving guests. The number of chef attendants is based on number of guests and action stations selected. Food will be prepared hot & fresh on-site whether we are using your equipment or we are providing our own. If using china, glassware and silverware, one dishwasher will be required for every 100 guests. Event Planners and Captain Management Services: Specialist Managers will plan layout, decor and logistics, estimate and order rentals, coordinate subcontractor vendors, and supervise the service crew. ACPB will coordinate with our clients to schedule a timetable that will guide rental set-up, program and food service. Food Services: ACPB chefs will supervise kitchen and food preparation. ACPB will set up food presentations, serve, maintain, assure sanitation, break down and clean up kitchen and serving stations. Staff will continuously clean-up used items. Beverage Services: ACPB bartenders will set up, serve, maintain, and clean up for beverage stations including ice cooling and replenishment. Service Crew Uniforms: Service crew typically wear black tuxedo pants with black button-down shirts, black ties or a custom designed uniform. Chefs wear professional culinary dress jackets with insignias and if requested—toques. Staffing Price Estimate: Fees include a set-up and clean-up minimum with a 4-hour actual event time. You will receive 3 hours of set-up, 4 hours of actual guest service event time and 1 hour of break down.